Rosacea treatments can limit the symptoms, making this inflammatory skin disease more manageable. Treatment is necessary because the condition will get worse if not attended to. Your doctor may recommend various types of prescription medications. A change in lifestyle may also be recommended. There are also numerous kinds of soaps, moisturizers and other skin products that may be used to improve the look of your skin. If the condition is caused by hot flashes, there are medications you can use. Topical treatments (gel, cream or lotions) may be applied on the affected parts once or twice everyday. This can lessen the inflammation. These may be taken in combination with oral medications. Topical treatments include benzoyl peroxide, antibiotics (metronidazole), azelaic acid and tretinoin. These medications are prescribed to stop inflammation more so than to eliminate the bacteria. Most oral antibiotics work quicker than topical treatments. Widely used prescription oral medications are erythromycin, tetracycline and minocycline. 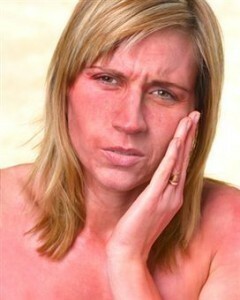 Isotretinoin (Accutane) is an oral medication used if the inflammation is severe and the other treatments do not work. This medication is usually recommended for cystic acne. Anyone taking this needs the supervision of a dermatologist due to potential side effects. Ocular rosacea is treated with steroid eyedrops or oral antibiotics. The rosacea treatment will depend on the gravity of the symptoms. Usually the condition will improve in a couple of months. If the blood vessels become permanently enlarged, surgery may be required. Methods include electrosurgery and laser surgery. They include pustules or red bumps on the foreheads, cheeks, chin and nose. Other signs are a reddish bulbous nose. The blood vessels on the cheeks and nose can be seen (telangiectasia). People may feel burning in the eyes. There is also the tendency to blush more quickly. The early signs include flushing easily. This progresses to redness in the center of the face. The symptoms will gradually worsen. The blood vessels will be seen at the nose and cheeks. The skin can become oily. Dandruff may also appear. Sometimes the condition is accompanied by conjunctivitis. Go to your doctor when the symptoms start to manifest. Unlike other skin ailments, this skin condition will not clear up without treatment. A visit to the dermatologist will allow you to get the proper diagnosis and medication. Warning: some over the counter (OTC) medications have alcohol and acids. These will make the inflammation even worse. Do not take any medications until you have gotten a diagnosis and prescription from the dermatologist. Self prescribing will almost certainly make it worse. Researchers believe that it is due to the environment, heredity or both. Other contributing factors may be sunlight, stress, vigorous exercise, anger, spicy food and hot baths. Some drugs may cause the inflammation too. There is no concrete evidence alcohol causes the inflammation. People who do not drink alcoholic beverages can still get this skin condition. Corticosteroids may also be a contributing factor. The rosacea treatments work best if the medications are completed. Stopping the treatment prematurely may necessitate long term treatment.